Bakırköy is a large, densely populated middle class residential suburb of İstanbul on its European side, between the E5 main road and on the coast of the Sea of Marmara. Bakırköy is an important shopping and commercial center for İstanbul. In Byzantine times Bakırköy was a separate community outside Istanbul, a well-watered pleasant seaside retreat from the city, and was called Hebdomon, distorted in Hepdoman. Here the Emperor Valens built the imperial Palace of Magnaura. The church of St. John in Hebdomon was also built here. Later the place was also named Makrohori ('the distant place') which was distorted to Makriköy ("Köy" meaning "village" in Turkish, used in place of "-hori") in the Ottoman period, when many large houses were built here. In 1925 this was changed to Bakırköy in a move to eliminate all place names of non-Turkish origin. Further out of town from the centre of Bakırköyis the town of Yeşilköy. There is little remaining of historical significance in the area: what there is includes a cistern, a powder house from the 17th century, the central mosque and fountain of 1875, an Armenian church and school and the resting place of the Muslim saint Zuhurat Baba, a Turkish soldier who died during the conquest of Constantinople. His resting place is often visited by women on Fridays. The seafront is now a popular location for tea gardens, clubs and restaurants. Bakırköy became a popular residential area in the late 19th century after the construction of a railroad connection to İstanbul and up until the 1970s was one of the most relaxed and desirable locations in the city. It is still populated by Istanbul's middle-class (trades people, bureaucrats, the retired). 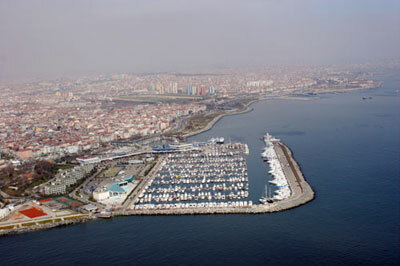 However, since the 1950s Bakırköy has grown considerably and is now heavily populated. It has not suffered the same scale of influx of people that have flooded in from Anatolia into the cheaper buildings in surrounding districts like Bağcılar, and Bakırköy appears tidier than those areas. However it still suffers from congestion and over-crowding. Where once were pleasant buildings in gardens, now are rows of apartment blocks, with gardens around them and not as tall or tightly packed together as the cheaper suburbs but blocks nonetheless. And this growth of course placed severe strain on Bakırköy's infrastructure. It is struggling to catch up and there is now insufficient space for children's playgrounds, parks and so on. Not to speak of car parking. Some parts of Bakırköy are very pleasant residential areas, particularly the streets from the hospital down towards the sea. The planned satellite town of Ataköy to the west of Bakırköy centre is very tidy indeed, and was probably Turkey's first successful planned development. Ataköy contains much social infrastructure including the Galleria Shopping Center and yacht marina. The center of Bakırköy is an important commercial district. There is a huge shopping district (including a number of huge shiny shopping centres as Carousel), a range of cinemas, bars and cafés. At the weekends Bakırköy is heaving with people from the poorer surrounding districts who come in to trawl for bargains in the crowded and dirty streets below the central square (Özgürlük Meydanı) and to eat at McDonalds or Burger King. (Bakırköy is not known as the classiest of Istanbul's shopping districts, nor does it have the student/intellectual customer base of Kadıköy or Beyoğlu). Boys from the outlying districts enjoy coming to Bakırköy to gawp at girls from Atakoy and the classier neighbourhoods. There is a lot of purse-snatching and pick-pocketing. Now (2006) the council is trying to smarten up the shopping district by pedestrianising more of it and putting in fountains etc. Bakırköy is easy to reach by public transport; there are dolmusues to Beyoğlu throughout the night; there are buses to Mecidiyeköy (although usıng the E5 by bus is unpleasant indeed: there is a ferry boat service that takes passengers to Bostanci on the Asian side of the city and also to the Adalar (Islands); and the light-railway from the airport to Aksaray runs through here. Veli Efendi Turkey's largest and oldest Hippodrome, built in 1913 for horse racing is close by. Atatürk International Airport is located here, in the quarter of Yeşilköy. A number of five-star hotels have been built around the airport. There is some textile production on the fringes of the area but Bakırköy is residential and commercial rather than industrial. Istanbul's largest mental hospital is in Bakırköy and the parkland surrounding it is the largest green space in the district. People believe the underground water of Bakırköy comes from the river Danube. Being on the Marmara shore Bakırköy is vulnerable to earthquake damage.